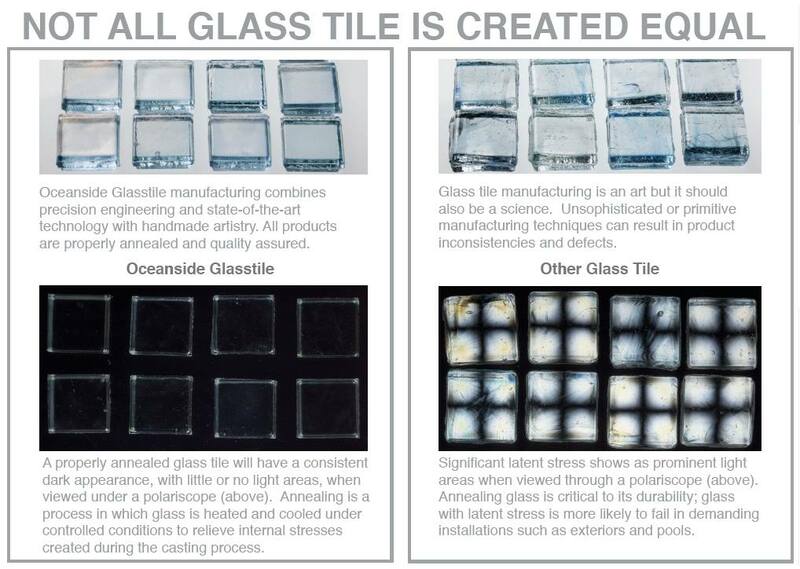 Until I saw this graphic recently, I had no idea that every glass tile wasn’t essentially the same. I did notice, however, that the price of glass tiles can vary wildly. Now I know why. From the information above: “A properly annealed glass tile will have a consistent dark appearance, with little or no light areas, when viewed under a polariscope….Unsophisticated or primitive manufacturing techniques can result in product inconsistencies and defects…Annealing glass is critical to its durability; glass with latent stress is more likely to fail in demanding installations.” You can see glass made by Oceanside Glass on the left, while the inferior glass is shown on the right. While it may not be a big deal if you are installing glass tile on your kitchen backsplash, the strength and integrity of the glass makes a big difference when you install it in an outdoor location, such as a swimming pool, or on your entry foyer floor. Before you buy glass tile, make sure you know what you’re getting for your money. That cheaper glass tile made overseas may not really be such a bargain after all.